Look for the free companion supplement coming soon to "Small Business Federal Government Contracting". The guidebook has been available as a free download at this site since 2012 and will remain so as a service to small business. Like the basic book, the supplement will be available as a free download from the first, vertical Box Net cube in the left margin of this site. 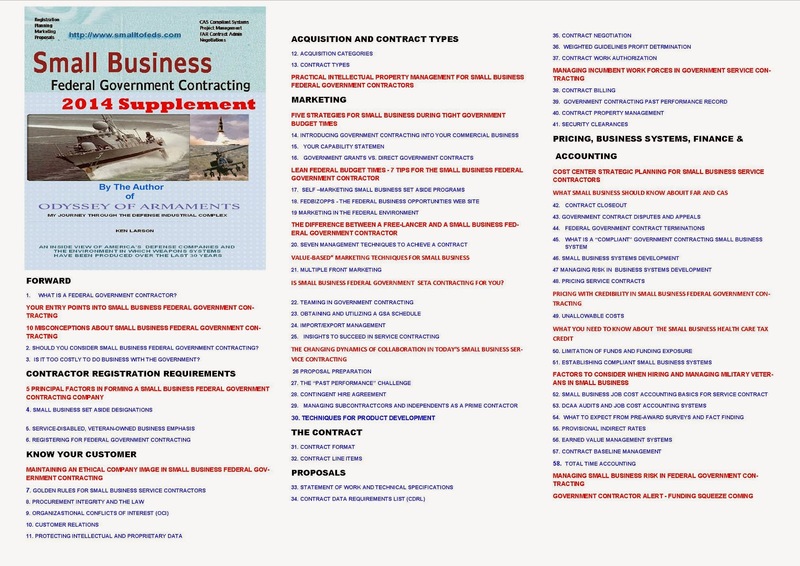 Projected supplement topics are annotated in RED on the 2012 table of contents at the below illustration. We look forward to seeing you back at "Small to Feds" on February 1st for your copy. Much appreciation to you for providing this important public service information! Excellent information. Thanks for writing it up for us. Thanks for taking the opportunity to share! Good to see something free to support small business. Great Post - looking forward to this great information! Even more big stuff for small biz! Thanks!